Here at Two Tone Kitchens we fabricate your kitchen worktops in our workshop. This allows us to get really creative with our designs and in the same time be competitive on the price. 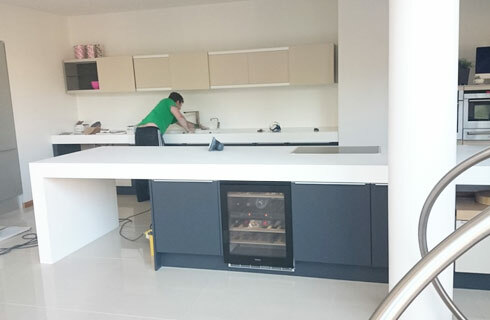 One of the main benefits of having our own worktop fabrication team, is that we do not depend on subcontractors and we can have your kitchen worktop ready in the same time as we complete your kitchen. Our kitchen showroom features one of the largest collection of kitchen worktop materials and designs for you to choose from. 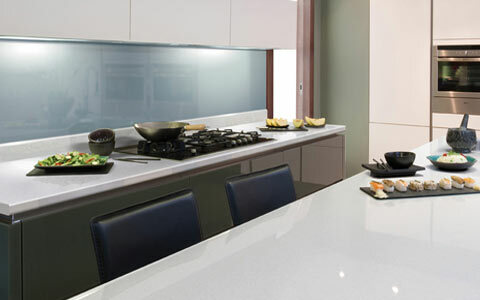 Find out more about available worktop materials for your kitchen worktop surfaces. 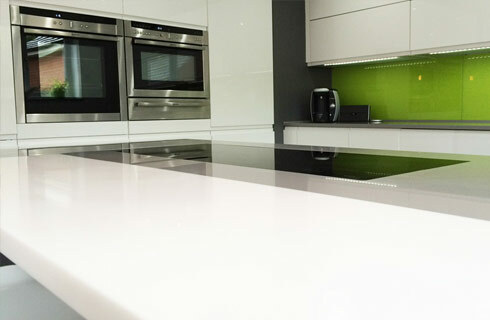 Corian is a seamless joint free worktop surface where you get to customise every aspect of the worktop. Quartz is a man made stone worktop surface that has non porous properties and great scratch resistance. Wide range of designs. Ceramic worktops offer ultimate durability as they are both scratch & heat resistant as well as non porous. Made out of 100% natural content. 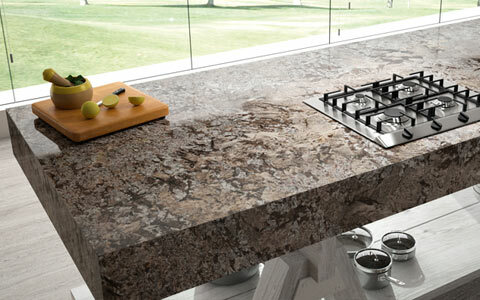 Granite worktops are naturally formed rock with unparalleled shine and character. Each Granite worktop is totally unique. Laminate worktops are the most affordable kitchen worktop surface option. Large number of designs. 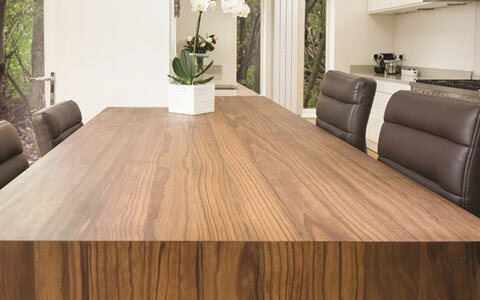 Naturally beautiful wood worktops carry a certain amount of character and traditional appeal. Eco friendly worktop surface option. Part of our premises is a dedicated workshop area where we make your worktops. One of the main benefits to you is that we can fully prepare your worktops in our workshop, therefore avoiding unnecessary mess which comes with on-site installations. 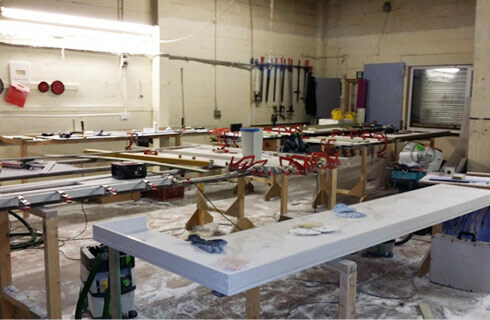 We specialise in fabrication of solid surface worktops such as Corian, Samsung Staron, Krion, Tristone, Mistral & Minerva which are all bespoke made in our workshop. Working with solid surface worktops enables us to fabricate worktops of any size, thickness and shape. This allows us to offer an unlimited number of customisations and ultimate bespoke worktop designs and options. 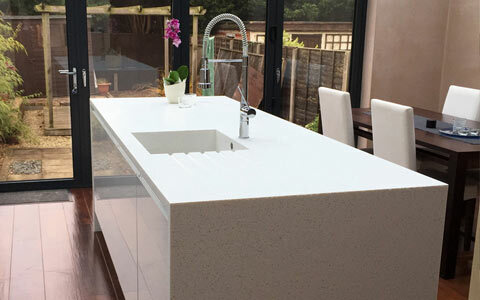 One of the main advantages of working with solid surface worktops is that it enables us to create worktops of any size or shape without any visible joints. With no visible joints your worktop surface will be seamless and exactly made to match your kitchen worktop requirements. The versatile properties of the material allow us to get really creative with the worktop designs and when it comes to worktops, you are only limited by your imagination. Our ability to create worktops with no visible joints and of any thickness and size, allows us to get really creative with worktop designs. We are able to make worktops in over 1000 designs with recessed sink areas, coved upstands, colour matching sinks or even worktops in two different colours. 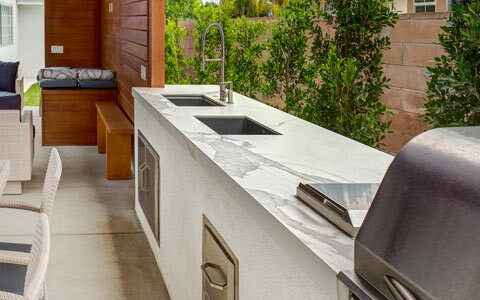 Our materials selection allows you to even combine two different worktop material types such as natural stone, solid wood, ceramic or even laminated breakfast bars. 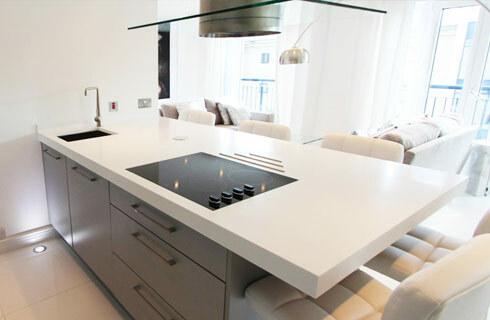 All of our kitchen worktop installations are performed by our experienced internal worktop installation team. Our typical lead time from templating to the installation of the your worktops is around 10 days. 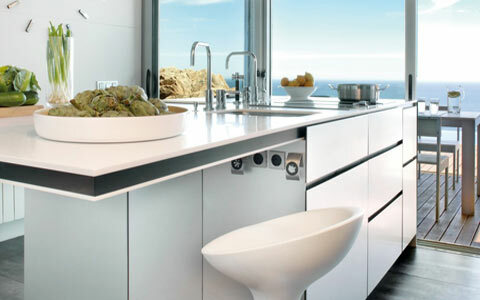 We provide a worktop fitting service for Granite, Quartz, Solid Surface, Wood, Ceramic and Laminate kitchen worktops. Our kitchen worktop fitting service includes all areas of UK mainland.